Legal news for Pennsylvania SUV rollover attorneys–Two volunteer firefighters and another teen were fatally injured in an SUV rollover wreck in Butler County, PA.
Butler County, PA (NewYorkInjuryNews.com) — Two volunteer firefighters, and another teenager were found dead in an icy lake in their upside down sport utility vehicle, Wednesday, January 27, 2010, according to the Pittsburgh Post-Gazette. 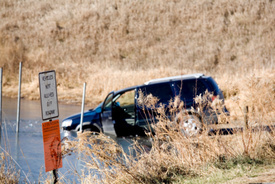 Responding police pulled the bodies from upside down SUV in the shallow freezing water. Police determined that driver of the SUV lost control on Ben Venue Road that runs along side a lake. Investigators believe that 18-year-old volunteer firefighter, Elijah Lunsford, was the driver of the Ford Explorer at the time of the crash. The two passengers were identified as Sam Bucci, an 18-year-old volunteer firefighter, and 17-year-old Trevor Barkley. All three of their families called police to report their children missing. The SUV was discovered around 5 a.m. Wednesday morning in the lake owned by Zelienople-Harmony Sportsmen’s Club. The three boys were seniors with very good reputations at the Seneca Valley High School. It was not determined where the boys had been going Tuesday night when the rollover occurred. Police investigators believe that the SUV had begun to skid on the gravel road, lurched down an embankment, and hit a tree before landing in the lake. Funeral arrangements for the boys are still in the process of being made. Police continue to investigate this tragic and fatal accident.